The UAE non-oil economy is set for a strong rebound with a projected growth of 2.8 per cent in 2018 and 3.3 per cent in 2019 after a slowdown to 1.9 per cent last year, the International Monetary Fund said on Wednesday. 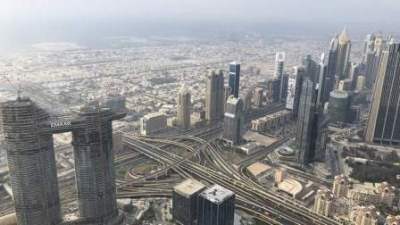 Jihad Azour, director of the IMF's Middle East and Central Asia Department, said Dubai would be a key driver of the resilience with its non-oil economy on track to record a 3.7 per cent growth in 2018 compared to 3.3 per cent in the previous year. Abu Dhabi's non-oil GDP is poised to grow by 1.1 per cent this year from 0.7 per cent negative growth in 2017. The emirate's oil GDP, which was -2.4 per cent in 2017, is expected to show a flat growth this year and rebound in 2019, the IMF official said while unveiling the fund's latest Regional Economic Outlook. According to the IMF, the UAE will need oil prices to average $71.5 and $64.8 per barrel respectively in 2018 and 2019 to balance its budget, while Saudi Arabia requires $87.9 and $77.9. The UAE, Saudi Arabia and other GCC states need to pursue their reform agenda in order to prepare for a post-oil order. Praising investment in education and innovation by the UAE, Azour called for region wide labor market and education reforms that boost productivity and create opportunities for everyone. "With growth prospects low relative to historical standards, it is paramount to accelerate the structural reform agenda and move to a new growth model that promotes diversification and private sector development," the IMF said in its report. Across the GCC, non-oil GDP is on track to grow to 2.7 per cent in 2018 and 2019 from 1.8 per cent in 2017 while oil GDP is expected to recover from -2.8 per cent in 2017 to 0.6 per cent and 2.2 per cent respectively in 2018 and 2019. The partial recovery in oil prices will be a boost for the GCC after the region saw its overall economic growth shrink by 0.2 per cent last year, impacted by a 0.7 per cent contraction by the Saudi economy, he said. "From 2019, the deferred expiration of Opec agreement means that oil GDP growth will pick up faster than anticipated, especially in the GCC," Azour said. In the Middle East, North Africa, Afghanistan and Pakistan region, nations are facing a multitude of challenges on the back of tightening liquidity, trade tensions and ongoing structural issues. "With growth estimated to have bottomed out in 2017, the overall outlook is little changed from the last quarter of 2017. Economic activity is projected to accelerate in 2018-19, but remain low relative to pre-2014 levels over the medium term. Specifically, overall growth for Menap region is projected at 2.8 per cent this year and 3.3 per cent in 2019," said Azour. Azour called for continued economic reforms in Arab countries despite a recent rise in oil prices and cautioned against complacency over a looming debt crisis. "Reforms should continue on track while reduction of deficit should be a priority. Required reforms include further steps toward full elimination of energy subsidies, and changes to pension and social security systems - including revisions to retirement age and benefits," the IMF official said. Despite the improved economic forecast, the IMF estimated cumulative overall fiscal deficits in the region to be $294 billion in 2018-22. Around $71 billion of government debt is expected to mature during the same period. Voicing concern over the rapid buildup of debt in many Mena countries, Azour said debt has increased by an average of 10 percentage points of GDP each year since 2013, with countries financing large fiscal deficits. According to the IMF, the economy of oil-importers should grow by 6.2 per cent annually to maintain unemployment at the current rate of 10 per cent. Mena countries need to create 25 million new jobs over the next five years. At 50 per cent, Oman has the highest percentage of youth unemployment of any Arab country. Seventy per cent of women in Oman are also outside the labor force, according to the IMF. In countries like Egypt and Saudi Arabia, more than 30 per cent of youth are unemployed and close to 80 per cent of women are outside the labour force.